I had some gorgeous lemons hanging around and after making risotto and cake with them I wanted something a bit different; that was when Alice Medrich’s lemon bars crossed my mind: they are the best lemon bars I have ever tasted (also dead easy to make) and on her wonderful book devoted to cookies I found (through EYB) a recipe for lemon bars with apricot preserves... That sounded too divine not to try. 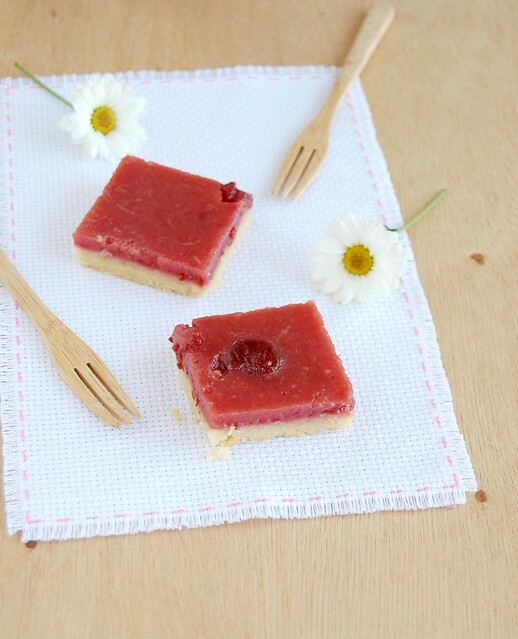 Since after making Jamie’s jam frangipane tartlets there was still half a jar of cherry preserves left in my fridge, cherry and lemon bars they became – and they were insanely good. Preheat the oven to 180°C/350°F. Line a 20cm (8in) square baking pan with foil, leaving an overhang in two opposite sides. Butter the foil. Crust: place the flour, sugar and salt in a large bowl and mix to combine. Add the butter and vanilla and mix until smooth. Press dough evenly on the bottom of the prepared pan. Bake for 25-30 minutes or until fully baked and golden brown in the center. Towards the end of the cooking time of the crust, make the topping: in a medium bowl, stir together the sugar and flour. Whisk in the eggs and vanilla. Stir in the preserves, breaking up any large pieces, then stir in the lemon juice. When the crust is ready, turn the oven down to 150°C/300°F. Pour the filling over the crust. Bake for another 20-25 minutes or until the topping no longer jiggles with the pan is tapped. Cool completely over a wire rack. Lift up the bars using the foil and cut into bars. Bars can be stored in an airtight container in the refrigerator for up to 3 days. Patricia, cherry-lemon bars are a brilliant idea! Why didn't I think of that? ;) Just beautiful! The bars look beautiful. I like the combination of flavors. Patricia I love lemons too. I have two lemon trees and I'm always looking for new ways of using them. These lemon bars are a brilliant idea. Thank you for sharing. i love this recipe because it lends itself to so many variations in topping flavours..your interpretation looks so pretty and delicious.. These look fabulous. I love lemon bars and this is a great spin on them!